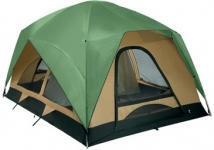 Go camping with the Coleman sundome tent. One (1) room, sleeps 3 with a 52-inch height at center and 49 sf of floor space. Freestanding design for quick set-up. Taped rainfly seams provide superior protection. Poles are made of 8.5 mm shock-corded fiberglass. 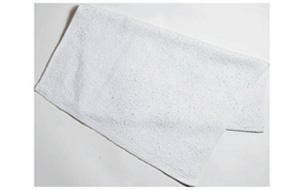 Product Dimensions: 7' 7'x52" Center Height Imprint Size: 16"W x 10.5"H. Case Pack Qty: 4 Case Pack Shipping Weight (lbs. ): 37. New Solar Shades are versatile 3-season shelters/cabana to provide protection from rain or sun whether you are at the beach or on a picnic, on the sidelines, or in your own backyard, A hood over front opening provides shade but allows for great visibility. Overnighter Camping Package includes: (1) Sundome 7' x 7' Tent, (1) 4D WideBeam, Spotlight / Fluorescent Lantern, (2) Sleeping Bags, (2) Stuff Sacks. Case Pack Qty: 1 Case Pack Shipping Weight (lbs. ): 53. Overnighter Camping Package includes: (1) Sundome 7' x 7' Tent, (1) 4D WideBeam, Spotlight / Fluorescent Lantern, (2) Sleeping Bags, (2) Stuff Sacks. Imprint Size: 15"W x 12"H Case Pack Qty: 1 Case Pack Shipping Weight (lbs. ): 53. Coleman 10' x 10' instant shelter offers 64 sq ft of shade. This shelter is 106" tall at the center. Features steel instant frame poles with easy push button release. 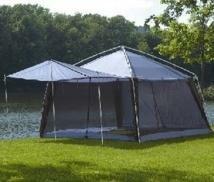 Canopy is constructed of 150D poly oxford with UV Guard protection to prevent fading. This shelter is quick and easy to set up and can be assembled in just a few minutes with the simple, one-piece frame design. Product Dimensions: 10" x 10" footprint x 106" Center Height Imprint Size: Screen: 18"W x 7"H Case Pack Qty: 1 Case Pack Shipping Weight (lbs. ): 53.5. Weekender Camping Package includes: (1) Sundome 7' x 7' Tent, (2) Sleeping Bags, (1) 2-Burner Stove, (1) 48 Qt Chest Cooler, (2) Stuff Sacks. Case Pack Qty: 1 Case Pack Shipping Weight (lbs. ): 84. Coleman Weekender Camping Package with Full Color Decal on 48 Qt Cooler. Weekender Camping Package includes: (1) Sundome 7' x 7' Tent, (2) Sleeping Bags, (1) 2-Burner Stove, (1) 48 Qt Chest Cooler, (2) Stuff Sacks. Imprint Size: 17-3/8"W x 8-3/8"H Case Pack Qty: 1 Case Pack Shipping Weight (lbs. ): 84. The all new Northern Breeze from Eureka! features a 144 foot shelter area off the front to accommodate a picnic table, A shock corded aluminum frame and Eureka! Hub speed set up. On stormy days, 4 attached wind curtains will keep you dry, 2 large doors. 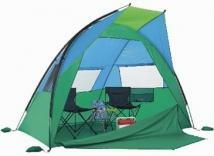 3-season, self-supporting 4-pole rectangular umbrella style tent. 2 doors and internal divider for 2-room option and easy access, 128 sq. ft, Sleeps 8.